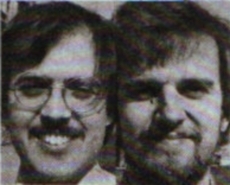 Previous Page > News, Reviews and Letters Index > News - Spectrum team deal their Ace. By Jupiter, It's a Forthcoming micro attraction! A NEW microcomputer for less than £90 has been launched by the same design team that produced the ZX Spectrum. 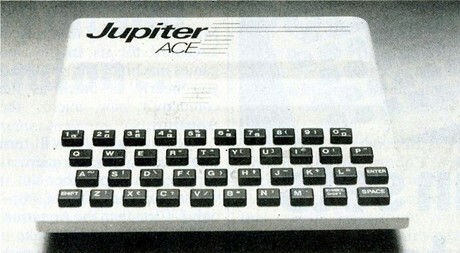 Called the Jupiter Ace the machine represents a departure from convention since it runs the high-level Forth language. The machine is based around the Z80A microprocessor and features 8K ROM, 3K RAM, 32 x 24 display output, sound, and full size moving keyboard. The launch follows considerable speculation concerning the activities of the two designers, Richard Altwasser and Steve Vickers, following their departure from Sinclair in April this year. The Jupiter Ace, at £89.95, is the first low-priced micro to use the Forth language. "We chose Forth in preference to Basic,- says Richard Altwasser, "because of its speed and flexibility. "It is a very compact language and memory goes much further. In Forth you can define your own functions and tailor your program exactly to your needs - that's why it is so exciting. "Basic has a fixed set of functions and, because of this. they are made as unspecific as possible. "In Forth you can define new functions in terms of those that exist in the Rom or in terms of those you have already defined. In this way you can extend the language in the direction of the program you want to write in a very concise way. "Forth is also so much faster - it is ten times faster than Basic." Initially the machine will only be available in a 3K black-and-white version but there are plans for a 48K Ram expansion, colour board and printer interface. The expansion and interface units should be available before Christmas. The Jupiter Ace will be manufactured close to where the two designers live in Bury St Edmunds. initially at a rate of 1000 per month. Richard Altwasser sees a broad market for the unconventional machine. "It will be popular in the educational field because Forth is an easier language for children to learn," he said. "But it will also have appeal as a games machine because of its very high speed and because the language allows such sophisticated user-defined graphics." The machine will be available in September by mail-order from Jupiter Cantab, 22 Foxhollow, Bar Hill, Cambridge.